Enter from the sunny bluestone patio to the shaded breezeway. 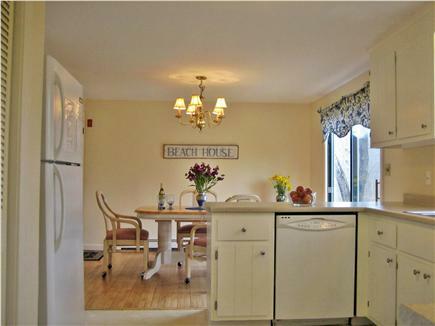 Enter the updated, fully equipt kitchen from the breezeway. Dining area with slider to the large private back yard. 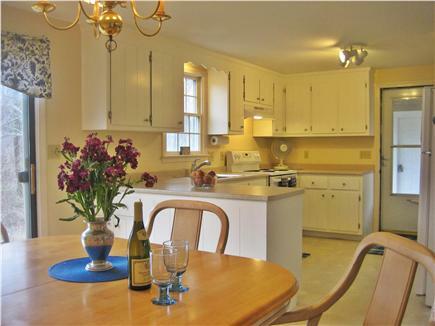 Living room flows into the dining area and kitchen. Cheerful living room with bright and sunny southeast exposure. First floor, king bed converts to twins, adjacent bath w/shower. 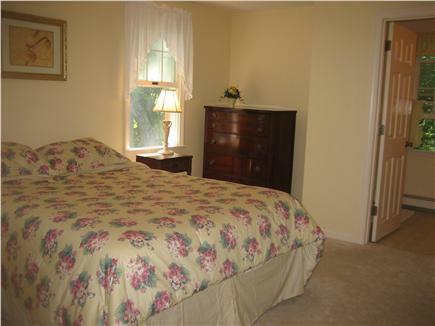 Second floor master, queen bed and private bath with shower. Two new bathrooms with showers for master and 1st floor bedrooms. 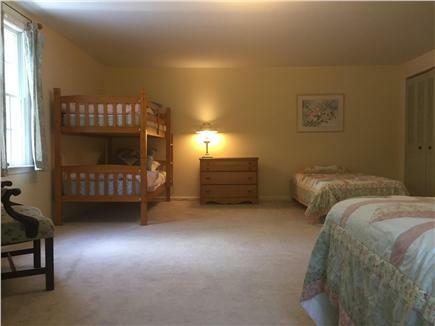 Large second floor bedroom- three twins and one full size bed. 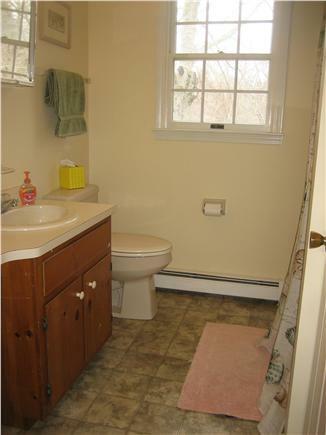 Second floor bathroom with tub. The protected breezeway for outdoor living! 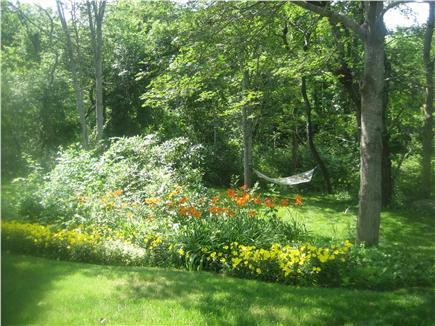 Large private back yard to play, relax or grill. This bright and sunny home is located right on the bike path! 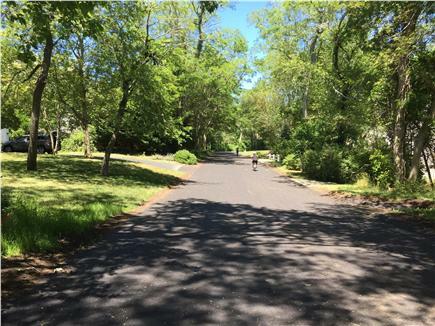 You will access this scenic trail at the end of the driveway for biking, jogging, and walking. 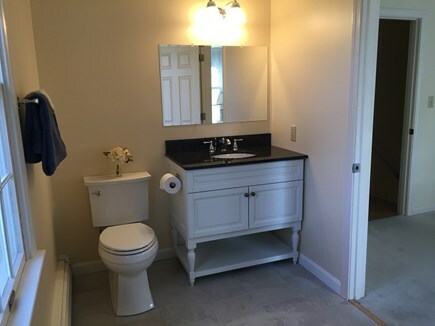 The house is clean, uncluttered, and has three bathrooms- one for each bedroom. 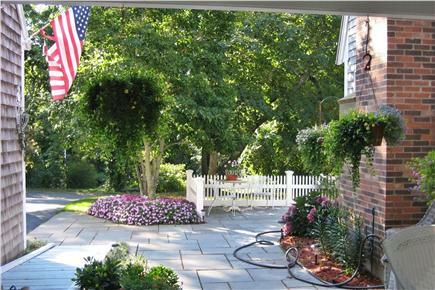 Great outdoor living features a covered breezeway surrounded by flowers and trees. It is a peaceful place for meals and relaxing, and a comfortable way to stay outside even in the rain. The large private back lawn is great for family games, grilling or relaxing on the hammock, while the sunny front blue stone patio provides room to spread out with a spectator’s view of the bike path. 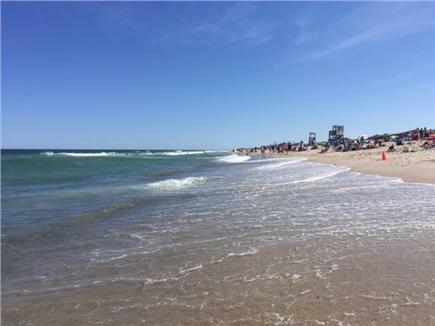 Skaket Beach is less than a mile away while Nauset beach is a short drive. The bike path leads straight to the quaint town center, less than a mile away. Just beyond the Center is Eldridge park home of the free Orleans Firebirds baseball games. Feel free to use the garage for storage and borrow our beach chairs, buckets, toys and games. The house is 1775 square feet and the bedrooms are separated from the main living areas. There are many plenty of fans- at least two in each room. Each bedroom has a window air conditioner during July and August. The kitchen is stocked with cooking utensils, bake ware, coffee pot and grinder, toaster, toaster oven, microwave, blender. Bathroom with shower- UPDATED for Summer 2107! Bedroom 2: Queen bed with bathroom and shower-UPDATED for Summer 2017! Additional pricing info: Refundable Security Deposit: $200. For visits shorter than a week, a $135 cleaning fee is charged. State and local taxes of 12.45% will apply. First floor bedroom, bathroom with shower. Double railed stairway to upstairs bedrooms. We liked staying at this property. It was bright, clean, and cute. Our teenaged kids liked being able to walk or bike along the bike path from right outside the home, and we enjoyed being extremely close to Skaket Beach as well as many restaurants. We also enjoyed the convenience of 3 bathrooms for everyone to shower quickly when coming back from the beach. Can't wait for our 2019 vacation! Our vacation was wonderful. The house is very well equipped, extremely clean. Pam was very easy to communicate with. Our family of eight plus a toddler enjoyed our stay very much. Thank you! My wife and I together with her mother who is relatively disabled recently stayed for just under three weeks. This is a beautiful house for simply relaxing and watching the wildlife, which was fascinating. The house and town are peaceful but, at the same time, for the more adventurous, there is plenty to do nearby so it would suit families who want to be peaceful like us or who want an active vacation. Perfect thank you, Pam. We hope to return. Hi, Pam – just wanted to thank you for all you did to accommodate us in your lovely house! The location was perfect – Tom and I rode our bikes every day on the trail, and my 90-year-old mom and her 93-year-old husband could walk safely on the path as well. 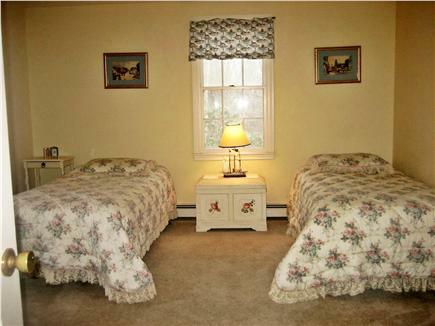 The layout of the house was great, too – first floor bedroom for Mom and Hank, upstairs for Tom and me. Everything was straightforward, and we had everything we needed. (We did have to replace one noodle since one of yours broke…). The weather could have been a little warmer :-), but all in all, we had a delightful time. Thank you again and for your flexibility in the dates we were there. The house is large enough for every family to have its own private space. We like biking and the fact the bike trail passes right in front of the house made it a great starting point. 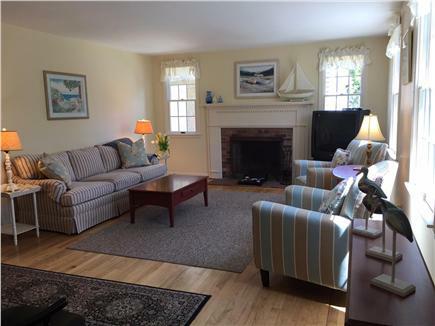 We were only a 10-minute ride away from Skaket Beach or the ponds of Nickerson Park. Many small errands could also be made by bicycle as the house is near the local shopping mall. We had a most relaxing time. The home is easy to be in. 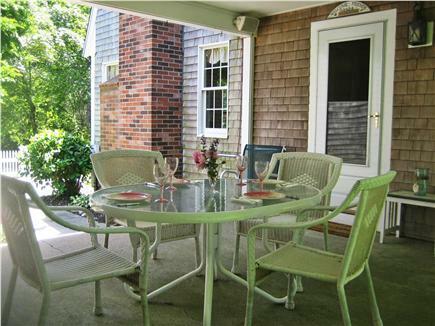 Sitting outside in the breezeway for breakfast or late in the day was wonderful- a delight. The bed was comfortable and showers great. The location is really the best. So near to the "sunset" beach. Only 12 minutes to the "sun rise" beach. With restaurants and market and CVS so close nothing was a hassle! Quiet and peaceful setting!!!! Third year and hope to go again next year! I can't thank you enough - we had a wonderful vacation. The grand kids especially loved "the game closet”. We absolutely love, love, love Orleans and the stay at your house made it perfect! This home has been in my family since it was built in 1986. My three children grew up coming here to visit my mother, their grandmother every summer. Fond memories were created playing in the tidal pools at Skaket Beach and flying kites in the evening at Nauset Beach. We pushed strollers, then taught our kids to ride their bikes on the bike path. Our extended family has gathered on the breezeway for many meals and celebrations. 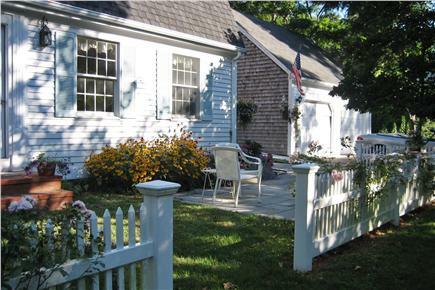 This home in Orleans has always been our ”little slice of heaven”. Now, our children have grown, the house is ours, and we all continue to enjoy our time here as much as ever. 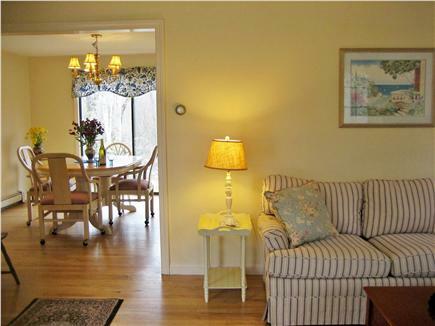 We love the way the house faces south, is sunny all day long, and each room has a cross breeze. One of our favorite things to do is to wake early and sip hot coffee on the breezeway while listening to all the birds singing in the private back yard. Sometimes the wind carries a salty breeze our way from Skaket Beach. Our goal is for our guests to have a wonderful vacation. We make upgrades or improvements every year based on the feedback from our guests. And, we hope that you grow to love this little slice of heaven as much as we do.